The Princessa de Penasco is a beachfront resort with many wonderful amenities. The resort was designed to emulate the shape of an arc. The arc is made up of five yellow towers that have a beautiful Old World Mexican courtyard in the center. The courtyard has several red brick walkways with flower lined grassy areas shaded by palm trees. The resort has premium amenities like 3 swimming pools, a Jacuzzi spa, and palm frond umbrellas above lounge chairs in the sand. The resort also includes a sand volleyball court where you can challenge your neighbors to a game and an ocean view fitness center that has everything you need to stay in shape. The resort also includes an on-site cantina called Colin´s . Colin´s has wonderful daily food and drink specials. This is a very safe resort with 24-hour on-site security. C 401 is a 2 bedroom and 2 bathroom condo is located on the 4th floor of the C Tower. 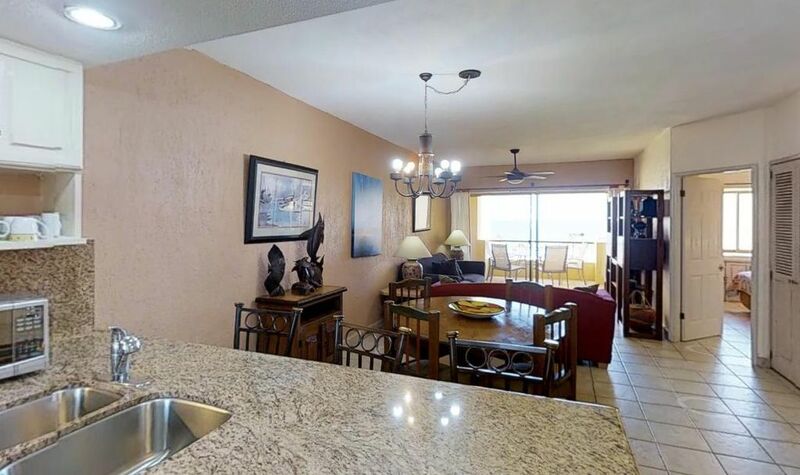 This condo has an ocean view with accommodations for up to 6 guests. The living room of the condo has soft yellow Venetian plastered walls with a dark brown leather sofa that folds out to a bed and a red fabric covered love seat. The red sofa has a striped Mexican blanket that brings all the colors of the room together. The room has a beech wood coffee table that sits on top of a hand woven colorful rug with a lighted beech wood table on each end of the sofa. The room has a media shelf that takes up the entire wall opposite the sofa set. The media unit has a TV, DVD, VCR and CD player. The shelves are adorned with décor, books and movies. In addition the condo has high-speed wireless Internet so you can upload your vacation pictures to Face Book or email your friends and family. You can get to the terrace through a set of sliding glass arcadia doors off the living room. In the dining room there is a round oak wood table that has painted dark green trim and four green cushioned chairs. The wall behind the table is adorned with a tropical painting that has a teal blue frame. In the kitchen there are white ceramic tiled counter tops with a red diamond tiled back splash. The kitchen has black appliances and fully stocked cabinets and drawers. The kitchen has everything you would need to feel as if you were cooking in your own home kitchen. There is a counter bar off the kitchen lined with three wood bar stools if you prefer a more casual dining experience. The master bedroom has a King size bed with a dark mahogany wood frame and arched headboard. The bedding is a mint green with peach colored accent pillows. There is a lighted mahogany nightstand on each side of the bed and a dresser with a television on the other wall. The room has a small double door closet on each side of the bay view window where you can hang your clothing. The room also has a lower storage compartment, which is useful for storing shoes and suitcases. The attached master bathroom has a single sink mirrored vanity with an additional mirrored door closet on the other side. The private bathroom has a walk in tub / shower made of travertine with a commode. The 2nd guest bedroom has a queen size bed with a black metal frame and solid tan colored bedding. Above the bed is a very colorful art print and each side of the bed has a dark wood nightstand with a reading lamp. The room also has a large dresser where you can put clothing. The room has a window that views the condo entrance and a large double door closet with full-length mirrors. The hall bathroom has a walk in shower made of travertine with a single sink mirrored vanity and commode. The terrace has a round ivory colored table with four matching chairs. The patio would be the perfect spot to kick back and relax with a cold beer or frozen margarita while you feel the warm ocean air kiss your skin. You should definitely dine outside in the evenings so that you can witness the world's most beautiful sunsets or take a trip on the Señorita Rita for a nice SunSet with a cold Margarita or a coold beer and snacks. Book your trip to paradise now! It was a pleasant experience, the front desk was very accommodating and friendly, however everything in the facility were under constructions. There was no Jacuzi, we have to wash our own towels. There was no towels to use at the pools. The beach was cold. We were at the 4th floor and I swear the people in the 5th floor just directly above us are constantly moving furniture day and night, and the loud banging next door was so loud everyday. I just felt like staying home. my home is more relaxing . Washing my own towels? I am supposed to be relaxing and not washing clothes or towels. There was only 2 sets of keys for me and the others, so I have to stay in the condo so my kids can get into the condo otherwise, no other keys for them to use. I mean the accommodation was cheap, no wonder why, it was uncomfortable stay. The cleaner didn't do anything except picking up garbage and provided us with laundry soap and tissue paper for the toilet. Very Nice clean. Close to everything.